Stephen Timbrook finds the right training mix to make sure he's primed and ready when disaster strikes. This 5-year veteran of the U.S. Coast Guard understands the urgency of being in peak physical condition. Lives are at stake, and Stephen Timbrook must be ready to put his body to the test whenever an emergency arises. Every day, people rely on him for their safety and well-being, so it's tantamount that Timbrook be up for the daunting, physical tasks that await. "You're constantly in gear; your vest, your gun belt. It's a physically demanding job. Wearing 30 plus pounds of gear for a long period of time there is a risk for back injury," says Timbrook. To lessen the chance of injury, Timbrook does alot of stretching and foam rolling. He also does a lot of cardio and CrossFit based workouts. "The benefits of CrossFit workouts is that you're getting the cardio and body strength conditioning mixed into one." Exercises that Timbrook performs to maintain his superior level of fitness include box jumps, burpees, pullups and situps. 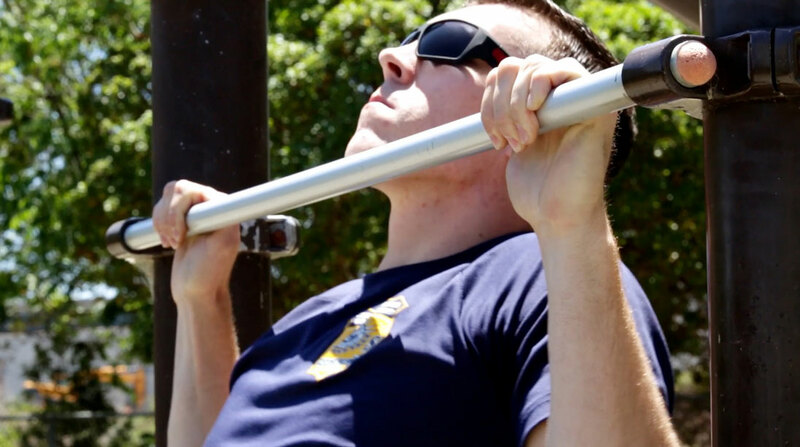 "Being physically fit is 100% required to do my job on a daily basis. Once your not able to pull someone to safety, climb a ladder or run after someone then you can't do your job." This Ultimate Conditioning Workout would certainly help him maintain his outstanding condition so he can continue to perform his duties to perfection.